Alexander Sargsyan was born on January 10, 1956 in Stepanakert, Republic of Mountainous Karabakh. 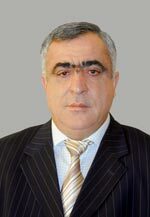 Mr. Sargsyan graduated from A. Tamanyan Yerevan Civil Engineering College in 1987. He is a gas economic-technician. From 1974-1976 he served in the Soviet Army. From 1996-1998 he was the deputy director of Yerevan Sirius OJSC. From 1999-2003 he was the head of Avtogas Ltd. Jrvezh Automobile Gas Filling Pressure Station #7. On May 25, 2003 he was elected to the NA from the proportional list of the Republican Party of Armenia and he is currently on the NA Standing Committee on Science, Education, Culture and Youth Affairs. He is a member of the Republican Party of Armenia Faction and has no political party affiliation. Mr. Sargsyan is married and has two children. The older brother of Defense Minister Serge Sargsyan insisted on Monday that he never considered emigrating or hid from anyone during his prolonged and mysterious absence from Armenia. Aleksandr Sarkisian, who owns a lucrative business and holds a seat in the Armenian parliament, also effectively admitted having moved a considerable part of his assets overseas. Sarkisian has spent most of the past year abroad and has not been seen in public in Armenia for many months. He is known to have lived for up to six months in Britain and other parts of Western European and was reportedly in the United States in the last few months. Sarkisian's absence prompted far-reaching speculation in the Armenian press. Some newspapers have alleged that he left the country for good, fearing retribution for a 2002 murder in Yerevan of a Russian crime figure of Armenian descent which was linked with his name. Sarkisian angrily denied such claims. `There is no guy in Armenian from whom I would run away. You understand?' he said. Sarkisian did not deny the report, saying that his visits abroad `had to do with both my health and business.' But he did not give details of his overseas business activities. `We are considered high-level officials and file financial declarations every year. I have a firm and engage in business. Fifty percent of the Multi Lion firm is mine,' Sarkisian said, referring to Armenia's leading supplier of liquefied gas to households, cars and buses. The rest of Multi Lion is owned by Gagik Tsarukyan, one of Armenia's richest men close to President Robert Kocharian and his powerful defense minister. It is part of Tsarukian's Multi Group conglomerate that comprises over 40 big and medium-sized businesses. Despite being lucrative, the vast majority of them were not included in the list of the country's leading corporate taxpayers released by the Armenian government earlier this year. Aleksandr Sarkisian, a controversial brother of Armenia’s former President Serzh Sarkisian, who was detained by Armenia’s National Security Service (NSS) on Wednesday, was released later that night after being questioned by investigators, a spokesperson for the NSS said today. Sarkisian was taken to the NSS following a search of his apartment in Yerevan that lasted for nine hours on Wednesday. Meanwhile, his son Hayk Sarkisian was detained by the Investigative Committee that later said he became a suspect in a reopened 2007 criminal case concerning attempted murder. The NSS for its part said in its statement today that Aleksandr Sarkisian was questioned over his other son Narek Sarkisian’s alleged crime in obtaining more than a dozen drawings of famous Armenian artist Martiros Sarian, whose estimated price is $280,000, by deception. “During the search Aleksandr Sarkisian said that the paintings were ostensibly bought by him. At the NSS Investigative Department he was interrogated on the circumstances of the deal. In addition, he was interrogated in the presence of the person who filed the claim and that person again insisted that Narek Sarkisian obtained the drawings though deception,” the NSS said. Meanwhile, the NSS said that Narek Sarkisian, who along with his bodyguard left for Moscow on June 22, has been put on a wanted list. The NSS also said that its operatives found two suitcases that Narek Sarkisian allegedly had asked a close friend to hide in another apartment. “In the suitcases found were narcotic substances of the cocaine and methamphetamine type, four guns, one of them with a silencer, bullets, drugs of unknown origin, glass and plastic pipes with white and black traces, droppers that were most likely used for drugs and other items,” the statement said. The NSS released a video later on Thursday showing the search at the apartment of Aleksandr Sarkisian where Narek Sarkisian is registered. Sixty-two-year-old Aleksandr Sarkisian, who is better known to the public as “Sashik,” is thought to have made a big fortune in the past two decades. Unconfirmed reports in the Armenian press have said that he spent millions of dollars buying real estate in Europe and the United States. Aleksandr Sarkisian was briefly detained on June 25 by police who found weapons in his car. Later Valery Osipian, the chief of the Armenian police, said that it was found out that the weapons were possessed by Sarkisian legally. Meanwhile, Serzh Sarkisian’s second, youngest brother Levon Sarkisian and his two children are suspected of “illegal enrichment” and could face prosecution on relevant charges after law-enforcement authorities discovered nearly $7 million held by them in an Armenian bank. The State Revenue Committee (SRC) launched criminal proceedings against them last week shortly after announcing that a company linked to Levon Sarkisian has been fined 800 million drams ($1.7 million) for tax evasion. The SRC said that while searching Sarkisian’s home its investigators found documents showing that he, his son Narek and daughter Ani deposited a total of $6.8 million in the unnamed bank “in the second half of 2017.” It said that the ex-president’s youngest brother and Ani Sarkisian failed to disclose these sums to a state anti-corruption body while Narek did not file any income declarations at all. Under Armenian law, such declarations are mandatory for high-ranking state officials and their family members. This legal requirement applies to Levon Sarkisian because he has long worked as ambassador-at-large at the Armenian Foreign Ministry. In a separate probe the Special Investigation Service last month brought charges of illegal enrichment against Vachagan Ghazarian, Serzh Sarkisian’s longtime chief bodyguard, who was remanded in custody on June 28. Ghazarian carried over $1 million worth of cash in a bag during his arrest. Police found another $1.1 million as well as 230,000 euros ($267,000) in cash when they searched his apartment earlier in June. This page was last edited on 19 April 2019, at 14:23.